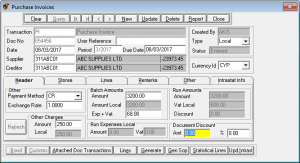 Cycom Purchase Order Processing System is a comprehensive System covering and supporting organizational purchasing needs throughout its entire life cycle from Requisitions to Orders to Deliveries to Invoices to Returns and Ex -Bond Transactions. 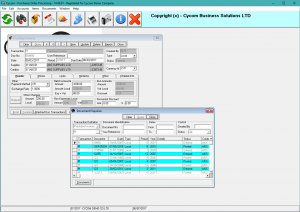 Flexible – Cycom Purchase Order Processing System offers unrestricted flexibility by allowing you to customize the system according to your Purchase Business Processes. You may define multiple transaction definitions that govern how the different purchasing documents will behave depending on your organizational needs. 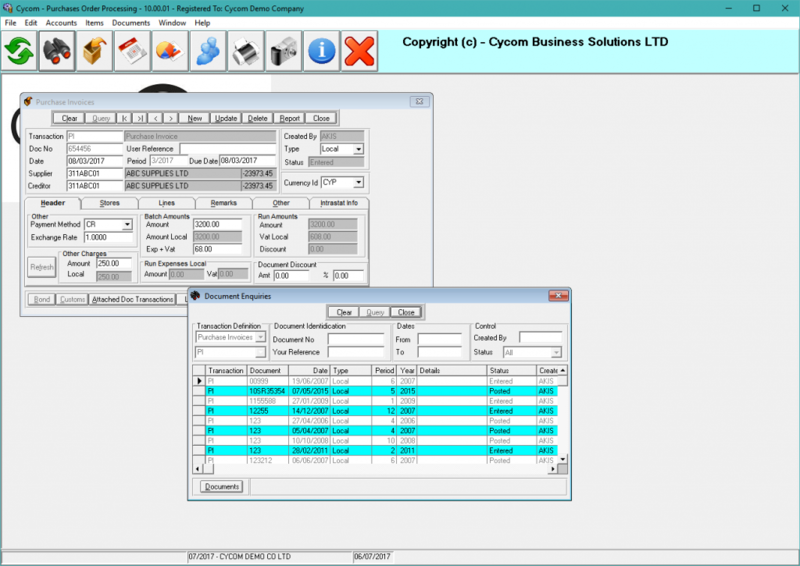 Simple to Use – Cycom Purchase Order Processing System incorporates internationally accepted graphical elements, according to the Microsoft Windows standard, delivering a familiar “look and feel”. This minimizes training time and allows users familiar with the Microsoft Windows interface to get “up and running” soon after the system is installed. The standard Windows on line help gives you instant reference information, eliminating the need to refer to printed manuals. 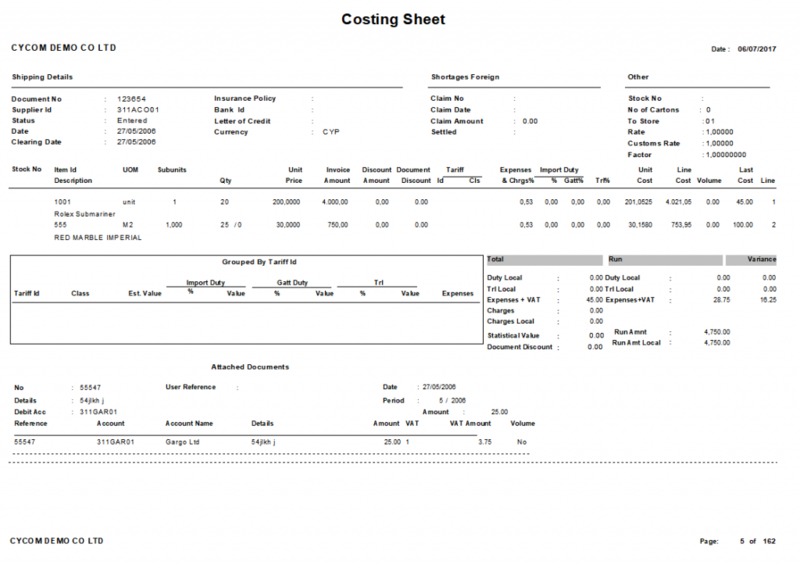 Customized Reporting – Reports can be generated as and when required. Flexible report selection criteria allow you to restrict the transactions to be printed and the way that these will be sorted. Using the preview windows, reports can be viewed on the screen before being sent to the printer. 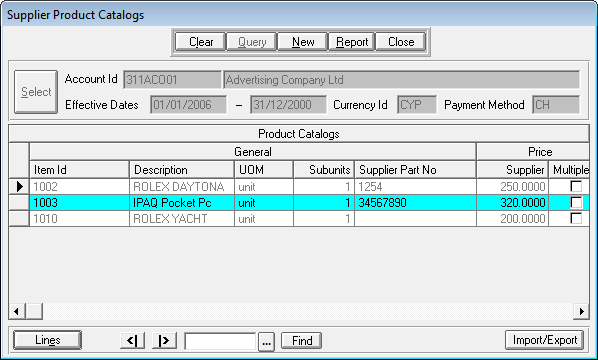 The Crystal Report Writer allows your expert user to design any custom report from the database without programming. 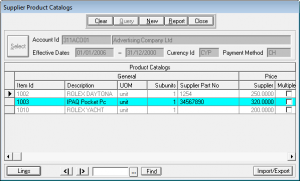 Ad-Hoc Queries – Enter your search criteria in the empty text boxes of a form and press the query button to have the system select all the transactions matching the criteria entered. Use the criteria sections of the document management forms to query by document status as well as other criteria available. View the results of the enquiry in a tabular form. Double click on any of the documents listed to navigate to the source entry documents. 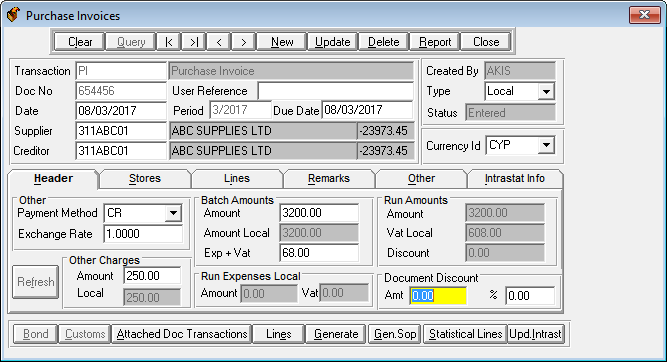 Integrated – Cycom Purchase Order Processing System is fully integrated with the Inventory, the Financial Management as well as the Address Management Systems both in terms of their visual interface as well as their underlying mechanics and database. All related systems are updated concurrently and no special or lengthy procedures need to be executed periodically. 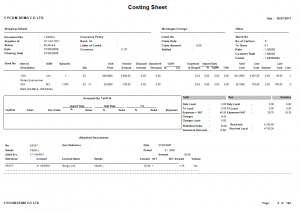 A purchasing document updates both the Inventory and Financial management Systems. Additionally, you may define multiple Interface definitions with the Financial Management System and thus capturing as much information as required in the Financial Management System in terms of Journals, Accounts and Transactions Analysis.